As some of you already know, over the past several months, I’ve been working with a team of collaborators spanning four States and several issue areas ranging from alternative mental health/medical response, to domestic violence survivor support, to police and prison abolitionists. Although we don’t all share the exact same politics, we’ve come together as one group (we’re calling ourselves the “Better Angels”) because we all agree that more has to be done to support communities of people whom the current system fails, regardless of whether that failure is deliberate or not. In the spirit of software development as direct action, we set out to design and implement free software that would have the maximum social impact with the minimum lines of code, as quickly as possible. Today, I want to introduce you to that software project, which we’re calling Buoy. 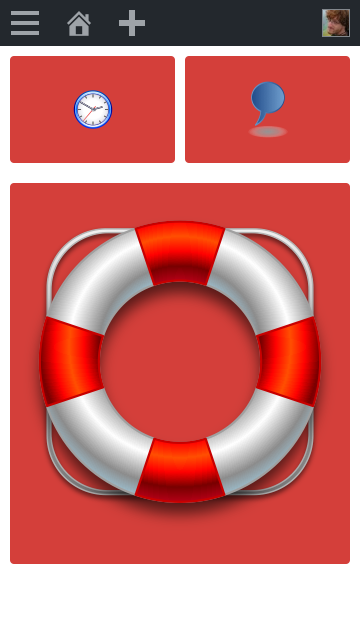 Buoy is a private, enhanced 9-1-1 for your website and community. We call it a “community-driven emergency dispatch system” because everything about its design is based on the idea that in situations where traditional emergency services are not available, reliable, trustworthy, or sufficient, communities can come together to aid each other in times of need. Moreover, Buoy can be used by groups of any size, ranging from national organizations like the National Coaliation Against Domestic Violence (NCADV), to local community groups such as Solidarity Houston, or even private social clubs such as your World of WarCraft guild. Indeed, the more community leaders who add the Buoy system on their websites, the safer people in those communities can be. One can imagine the Internet as a vast ocean, its many users as people sailing to the many ports on the high seas. Buoy is software that equips your website with tools that your users can use to help one another in the real world; the more buoys are deployed on the ocean, the safer traveling becomes for everyone. Using Buoy is simple. 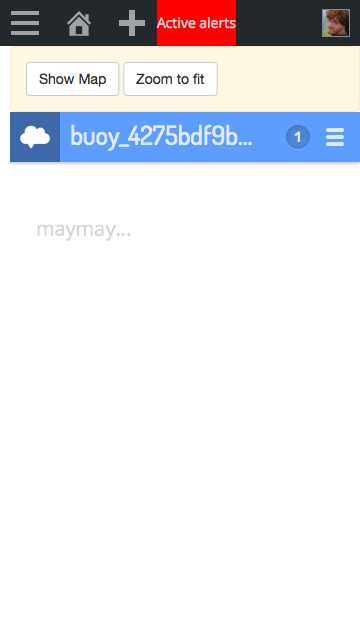 After a website admin installs and activates Buoy, each user of that website can define their personal response team by entering other users as their emergency contacts. This is shown in the screenshot below. 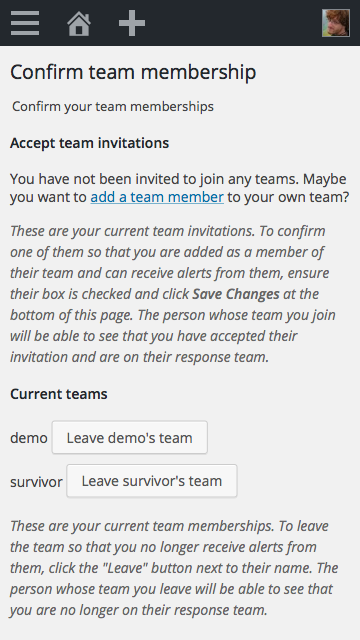 The “Choose your team members” page, available under the “My Team” heading in the WordPress dashboard menu, allows you to add or remove users from your response team. When you add a user, they receive an email notification inviting them to join your team. 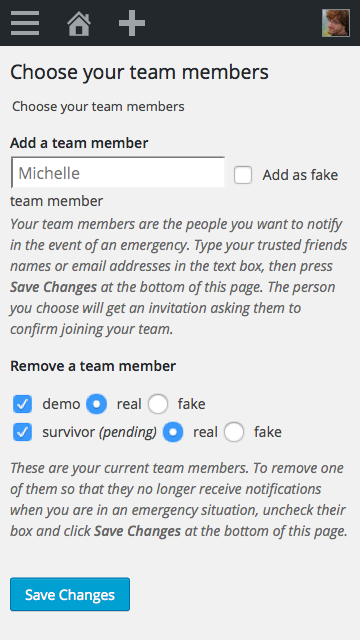 When you are invited to join someone’s response team, you receive an email with a link to the “Team Membership” page, shown here. On this page you can accept another user’s invitation to join their team or leave the teams you have previously joined. After at least one person accepts your invitation to join your response team (i.e., they have opted-in to being one of your emergency contacts), you can access the Buoy emergency alert screen. You can bookmark this page and add it to your phone’s home screen so you can launch Buoy the same way you would launch any other app you installed from the app store. Pressing the large button nearest the bottom of the screen activates an alert and immediately sends notifications to your response team. 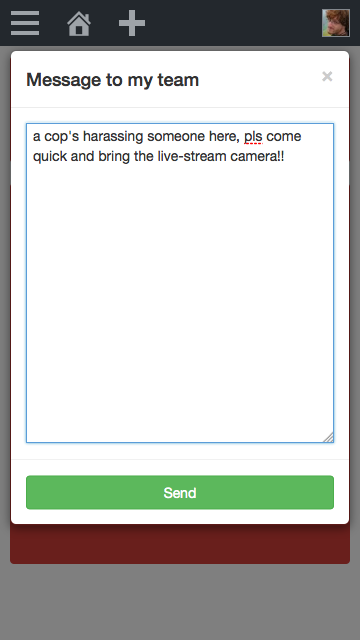 Clicking on the smaller button with the chat bubble icon on it opens the custom alert dialog, shown next. Using that button with the chat-bubble icon on it, you can provide additional context about your situation that will be sent as part of the notification responders receive. 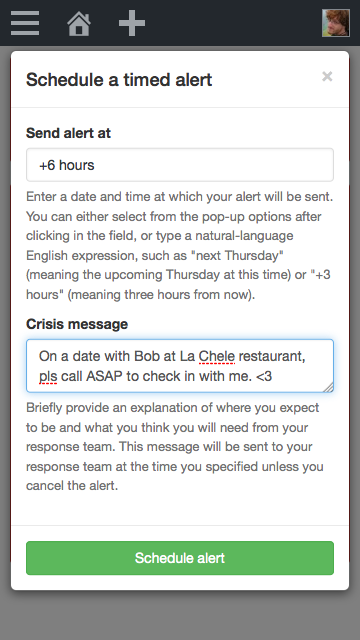 For some use cases, however, sending an alert after an emergency presents itself isn’t enough. Unfortunately, this is the only option that traditional 9-1-1 and other emergency dispatch services offer. In reality, though, there are many cases where people know they’re about to do something a little risky, and want support around that. This is what the other button with the clock icon on it is for. Clicking on the smaller button with the clock icon on it opens the timed alert (“safe call”) dialog, shown next. Use this button to schedule an alert to be sent some time in the future. This way you can alert your response team to an emergency in the event that you are unable to cancel the alert, rather than the other way around. This is especially useful for “bad dates.” It’s also useful for border crossings or periodic check-ins with vulnerable people, such as journalists traveling overseas. Regardless of which alert option you select, Buoy will gather some information from your device (including your location and your alert message) and either send your alert to your response team immediately or schedule the alert with the Buoy server. A nice pulsing circle animation provides visual feedback during this process. 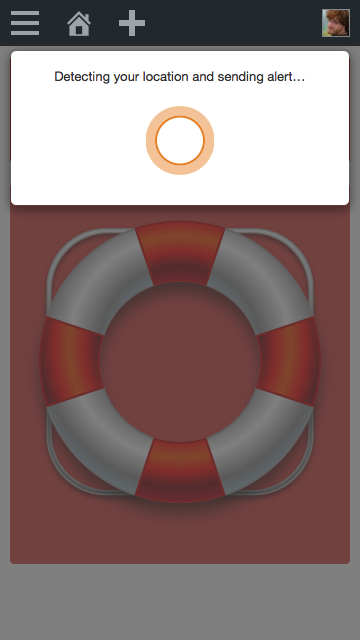 If you pressed one of the immediate alert buttons, the next thing you’ll see when you use Buoy is some safety information. This information is currently provided by the website admin, but we have some ideas of how to make this even more useful. Either way, if it is safe to do so, you can read through this information and/or take one of the suggested actions immediately. 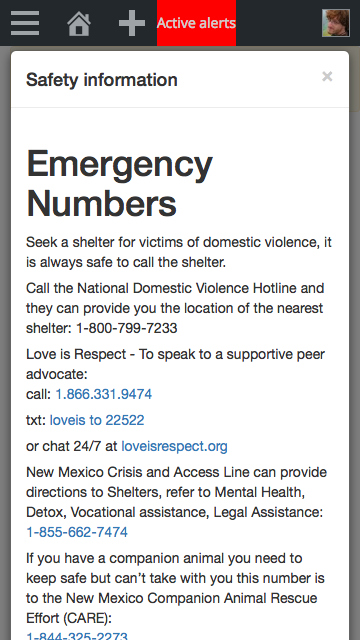 In the example screenshot here, Buoy has been installed on the website of a domestic violence survivor’s shelter, so the admin composed safety information that helps DV survivors quickly find and access even more supportive resources, such as hotlines and other nearby services like animal rescuers. If you’re in an emergency situation where interacting with your phone isn’t feasible, such as if you are being beaten or chased, you can simply ignore this screen. As long as you don’t lose or shut off your device, your device will send your location to your response team so that they will be able to track and find you, even if you travel away from the spot where the crisis originally began. If you can interact with your phone, you can also close the safety information window at any time. When you do, you will see that behind the safety information window, a private, temporary chat room has been loaded in the background. 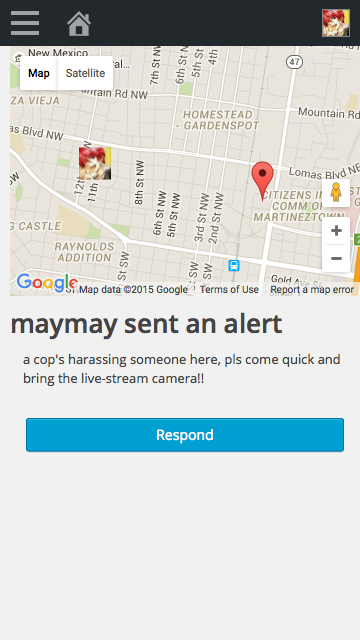 When one of your response team members responds to your alert, they will join you in this chat room. On the map, a red pin shows the initial location of the emergency. Your avatar shows your current position. 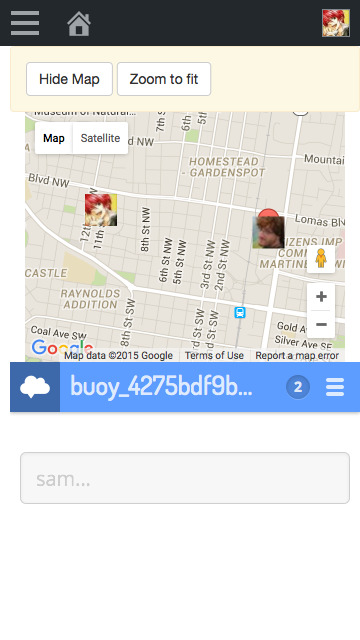 As responders respond to your alert, their avatars will also be added to the map. 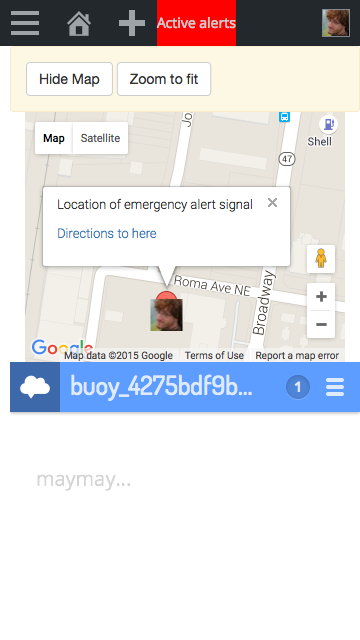 Buoy is just as easy to use from the point of view of a responder, as it is from the point of view of someone sending an alert. When a responder clicks on a notification from the alert (either by email, SMS/txt message, or whatever other notification mechanism they prefer—we are continually working to add new notification channels as our people-power and resources allow), they will be shown your alert message along with a map. They can click on the red pin to get turn-by-turn directions from their current location to the emergency alert signal. If they choose to respond, they click on the “Respond” button and will automatically be added to the group chat shown earlier. When a responder clicks the “Respond” button, they will automatically be added to the same live chat room that the alerter is in. They will also see the same map. 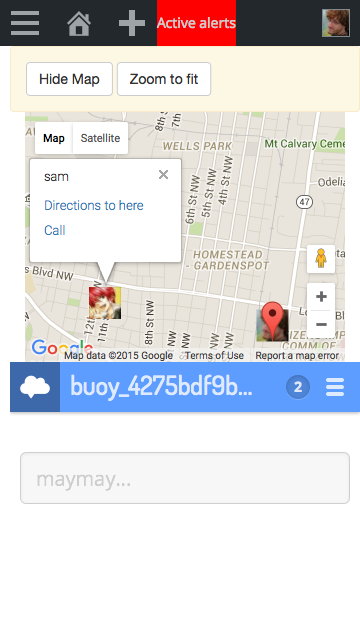 The alerter and all current responders become aware of new responders as they are added to the chat room and the map. As people involved in the incident move around in the physical world, the map shown to each of the other people also updates, displaying their new location in near real time. Clicking on any of the user icons on the map reveals one-click access to both turn-by-turn directions to their location and one-click access to call them from your phone, Facetime, Skype, or whatever default calling app your device uses. Who should use Buoy? Should it only be used in emergencies? Although Buoy is designed to be useful in even the most physically high-risk situations such as domestic or dating violence abuses, kidnapping, home invasion, and other frightening scenarios, you can use Buoy however you want. We particularly encourage you to use Buoy when you feel like your situation may not rise to the level of calling 9-1-1 or when you feel like the presence of police officers will not improve the situation. If you feel you are being followed as you walk home on campus, use Buoy. Your friends will be able to watch your location on their screens and quietly chat with you as you walk home, ensuring you reach your destination safely. If you or someone you are with feels suicidal, or is having a “bad trip,” and you don’t want cops showing up to your house but need assistance, use Buoy. Responders will be notified of your physical location and will be able to coordinate a response action with you and with each-other in real time without ever notifying the authorities of the situation. If you are with a group at an outing such as a hike or a large amusement park and get separated from your group, use Buoy. Each group member will be able to see one another’s current location on a map, can easily coordinate where to meet up, and can even access turn-by-turn directions to one another’s locations with one tap of a finger. Undocumented immigrant and homeless populations. Domestic violence victims and survivors. Social justice and social change activists/political dissidents. Frequent targets of assault and street harassment (trans/queer people, women). People suffering from a medical or mental health emergency. Especially all the intersections of the above (homeless feminine queer youth of color, for instance). In other words, these are all demographics who could benefit by having “someone to call” in the event of an emergency for whom “the police” is obviously a counterproductive answer, because when police are involved they are more likely to escalate the situation than de-escalate it. That said, even if these descriptions don’t fit who you are, you can still use Buoy and if you do, we hope you find it useful. How can I get Buoy? Buoy is a bit like a very advanced telephone. Just like a telephone, it’s not very useful if no one else you know has one! For Buoy, or a telephone, to be useful, you have to know someone else who already has it. That being said, if you are a community leader, and you maintain a WordPress-powered website, you can try out Buoy right now by installing it directly from your WordPress admin screens! It’s just as easy to install as any other WordPress plugin. Similarly, if you yourself are not a “community leader,” but you want to try it out, you can either ask to join our private testing phase or you can tell others in your community about Buoy and see if the group of you can install it on your own group’s website. If you do that, don’t hesitate to ask for technical or other help of any kind over at the Buoy support forums. How can I help Better Angels projects? There’s a lot you can do to help make Buoy better or help the Better Angels collective more generally! Check out our contributor guides for more information! Of course, one of the most immediate things you can do to help is spread the word about this project. (Hint hint, click the reshare button, nudge nudge!) Cash donations are also very helpful! Finally, we’re also trying very hard to get the entire tool translated into Spanish, so if you’re bilingual and want to help, please sign up to be a Better Angels translator here. We think Buoy is a great tool for building strong, autonomous, socially responsible, self-sufficient communities, and we hope you’ll join us in empowering those communities by making them aware of Buoy.